It's not just because people are moving here in record numbers. The hikers in our area have increased seven times faster than the population overall. Could a love for pretty Instagram photos be partly to blame? Let me tell you about my most recent hiking adventure. It was a sunny, warm Sunday in late summer, and my friends and I decided to hit Snow Lake, a popular spot less than an hour’s drive from Seattle. We probably left a little later in the morning than we should have, and trying to find parking was not unlike Capitol Hill on a Saturday night. The trail was jampacked, a steady stream of people and dogs all the way up and all the way down — not quite the escape from crowded city life we’d hoped for. I suspect a lot of folks around here can relate. 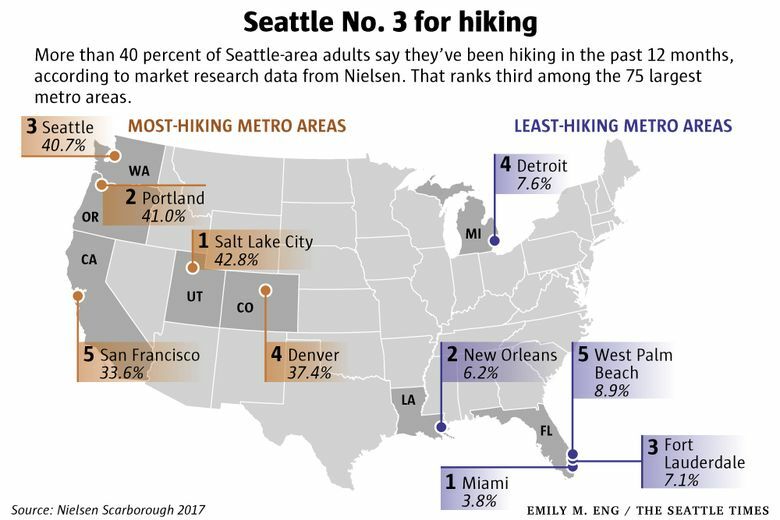 More than 940,000 adults who live in the Seattle area say they’ve been hiking in the past 12 months — double the number from 2008, according to survey data from market-research firm Nielsen. Part of the reason there are so many more hikers here is the same reason that traffic is so much worse these days — there’s just a lot more people living here. But that’s not the whole story. In fact, the increase in the number of hikers is seven times greater than our population growth over the past decade. Hiking has always been popular in Seattle, for obvious reasons. But right now, hiking is having its moment. In 2008, less than a quarter of local adults said they hiked, according to Nielsen. Last year, it was 41 percent. That ranks Seattle third for hiking among the 75 largest metro areas included in the survey. Salt Lake City is No. 1, with 43 percent of adults saying they hike. Portland comes in second, by just a fraction ahead of Seattle. The place where hiking is least popular? Miami, by a fairly wide margin. It’s not that you can’t hike in Florida, which has more than 5,000 miles of trails. But if you’ve ever wondered how many people would choose to trek through the Everglades, fighting off mosquitoes, rather than hang out at the beach — well, here’s your answer: 4 percent. That’s how many Miami adults have been on a hike in the past 12 months. 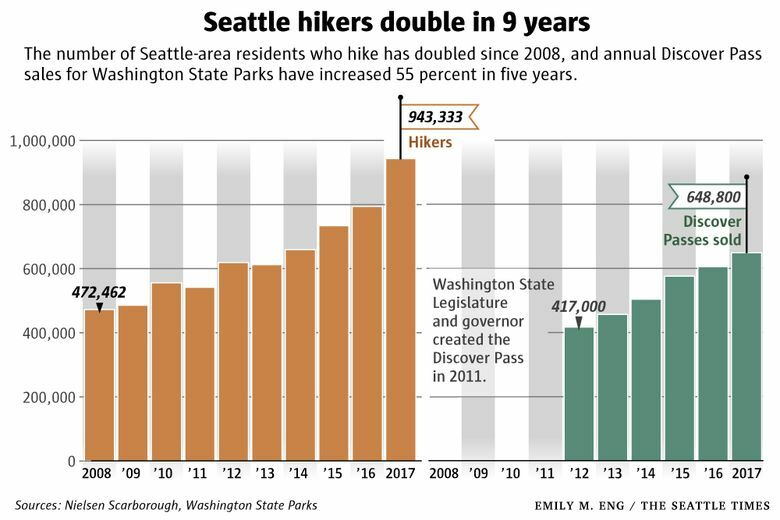 The data show that hiking has grown in popularity pretty much everywhere over the past decade — even in Miami, a bit — but the increase here in Seattle has easily outpaced the national average. Ramos says there’s been a surge in visitors to the WTA’s website, and in the number of folks leaving trip reports, which are kind of like Yelp reviews for hikes. For the most part, millennials. According to Nielsen, there’s been a significant shift in the age demographics of hikers in the U.S. In 2008, adults age 35-49 had the highest rate of participation in the activity. Not anymore. Nationally, interest in hiking has doubled among those 18-34, surging from a participation rate of 15 percent in 2008 to 30 percent last year. This change has shaved more than three years off the median age of the American hiker (it’s now 38). 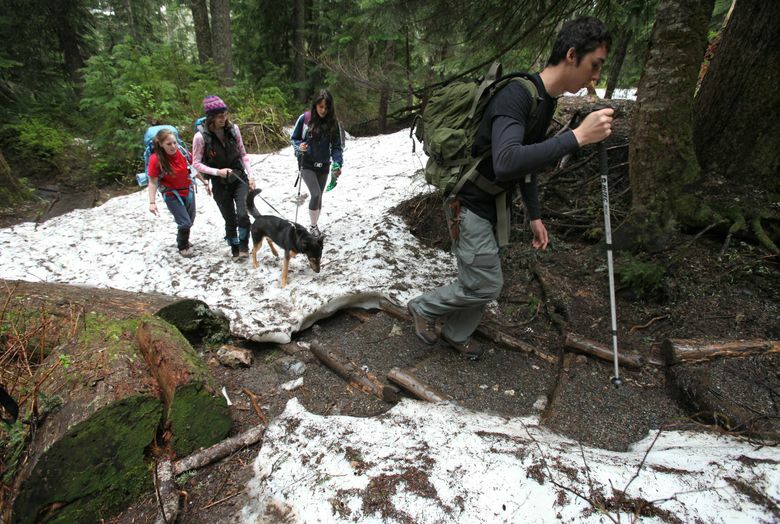 It seems likely that Seattle’s hiking boom is related to the influx of young newcomers to this area — and well over half of millennial-age residents here say they’ve been hiking in the past 12 months, according to the data. Some people point to the 2012 best-selling memoir “Wild” by Cheryl Strayed (and the subsequent movie), about the author’s cathartic, 1,100-mile trek on the Pacific Crest Trail, as sparking a new interest in hiking among young people. And then there’s the Instagram effect. Maybe you felt a twinge of jealousy seeing your friends’ awesome hiking photos on social media. The next thing you know, you’re on the mountain, taking your own awesome photos — and, naturally, sharing them on social media. Nielsen data show that people who hike are 43 percent more likely than average to have used Instagram in the past 30 days. Ramos thinks it’s because folks need that outdoors “fix” now more than ever. While the influx of new hikers presents some challenges in terms of overcrowding and trail maintenance, Ramos believes the positives outweigh the negatives. “There are places where we need to be thoughtful, and where the crowds do have an impact. But are there too many people out hiking?” she said. Ramos points out that hiking’s surge in popularity also represents an economic opportunity. The outdoor-recreation industry is booming across the country, and particularly so in Washington. Nielsen surveyed more than 2o0,000 adults age 18 and over in metro areas around the nation from June 2016 through November 2017. In the Seattle area, which includes King and Snohomish counties, 2,265 adults were interviewed.